In a previous post I looked at price-to-rent ratios in major markets. Like a PE ratio for stocks, price-to-rent ratio is a decent benchmark for judging whether housing markets are over or undervalued. There are caveats to this, of course, including prevailing mortgage rates, real estate taxes, income tax giveaways, etc. But for it’s simplicity, I like price-to-rent as you see what your expected yield might be on a typical house. This ratio is very different depending on where you look. From Zillow’s real estate research, the highest price-to-rent ratio in January 2015 was in San Jose, CA at 22.01. The lowest was 6.82 in Cumberland, MD. Looking at median household income, the comparison is similar: San Jose’s was about $80k in 2012, Cumberland’s $31k. Needless to say, lower P/R metro areas seem less desirable. Maybe folks with more income also demand more housing equity as part of their personal capital structure. Maybe hot economic areas pull in so many more people that purchase prices never reach a high enough equilibrium. Or maybe the higher P/R is just anticipating higher rents. Like stocks that grow more quickly, a higher P/E ratio is not necessarily a bad thing. In any case, It’s hard to judge a great real-estate investment by valuation alone. Therefore I’ve put together a scatter plot using two simple measures: price/rent ratio for valuation vs. one-year price increase. Not surprisingly, we get a significant relationship between the two (higher price/rent correlates to higher past price increase). But what’s interesting here isn’t necessarily those markets that hug the trend line. In fact, what catches my eye are the outliers. Here there are four quadrants of outliers, which I’ve labeled in the corners of the graphs. High valuation, rising price (growth): With already high valuations, the markets in the top-right corner look like they’re jumping even higher. A lot of folks would use the term bubble. I would point those folks to Kevin Erdmann’s excellent article on human capital and low risk assets. All these markets are in hot economic areas drawing ever greater amounts of human capital to them. But as an investment idea, I might avoid them, just in case. 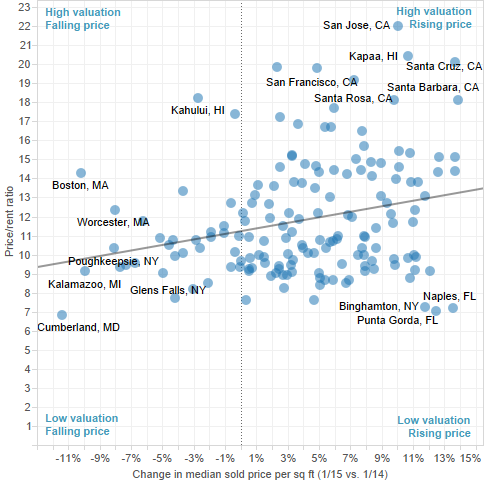 High valuation, falling price (adjusters): There aren’t many markets in this category. Boston sticks out as one. I have to think that a high valuation coupled with a falling price points to frothier prices in the past. Perhaps the likes of San Jose & Santa Cruz will end up in this quadrant next year. Only time can tell. Low valuation, falling price (value trap): These markets are like your typical value trap stock. They are cheap, but prices are falling. If no one wants to live in a market, you’d expect this exact scenario. While you might buy to become a landlord, you might just have your yields evaporate right from under you. Low valuation, rising price (real value? ): A place where price/rent is low, but that shows price increases over the past year is what I would be excited about. Milton Friedman once described economic movements like a string. You pluck it, it vibrates, then snaps back into place. These markets look most like they are snapping back to a higher valuation. What these different groups do in the coming years is, like various stocks, anyone’s guess. It’s extremely hard to predict which metro area will become part of the new Silicon Valley and have prices skyrocket, just like it’s hard to know which company will be the next Google. But if you want a margin of safety in real estate, you could do worse than to look further into low-valued markets that appear to be heating up.